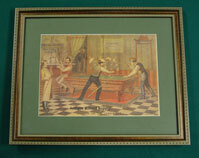 #9-01 Original print produced by the Brunswick-Balke-Collender Company about 1910. 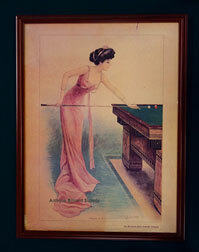 The image is from a watercolor by Archie Gunn, a renowned artist of the time, and this poster was used by Brunswick to encourage more women to play pool. The pool table is the Brunswick Alexandria model, shown in the carom version with no pockets. About 18 inches wide, 24 inches tall. 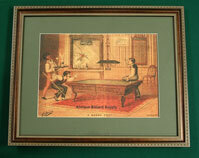 #9-03 This extraordinary framed color lithograph advertises Falk's Milwaukee Beer, A Werner & Co. Champagne, and The Brunswick & Balke Co. Copyrighted in 1882 prior to the start of the Brunswick-Balke-Collender Company. The pool table shown is a rare Exposition Novelty model, which is virtually never seen in early advertisements. Paired with 9-04, the set of two presents a unique opportunity to own a true piece of American billiard history. The frame is about 22 inches wide, 18 inches tall. #9-04 This second framed color lithograph, like 9-03, advertises Falk's Milwaukee Beer, A Werner & Co. Champagne, and The Brunswick & Balke Co. Copyrighted in 1882 prior to the start of the Brunswick-Balke-Collender Company. The pool table shown is a rare Exposition Novelty model, which is virtually never seen in early advertisements. Paired with 9-03, the set of two presents a unique opportunity to own a true piece of American billiard history. The frame is about 22 inches wide, 18 inches tall. 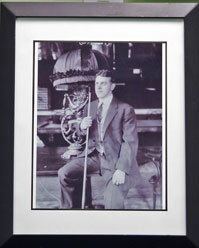 #9-05 Nicely framed photo of Willie Hoppe as a young man. 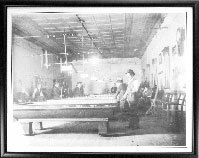 Black and white scene shows Hoppe posed with cue ready for a match. Black beveled frame provides perfect accent. About 16 inches wide, 20 inches tall. Excellent condition. 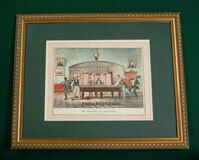 #9-07 An original 1871 Currier & Ives color print. An unusual find in very good condition. Shows group of players around an antique pool table with six legs. About 22 inches wide, 18 inches tall. 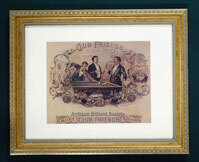 #9-08 Late 1800 cigar box sample label with billiard theme. Excellent color image in very good condition. About 16 inches wide, 13 inches tall. #9-10 Original print from a pen and ink drawing by Vincent Van Gogh. The painter, who died in 1890, is one of the Netherlands' most famous artists and used drawings like this to practice his artistic skills. 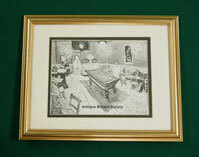 Shows billiard room with pool table and accessories. About 16 inches wide, 13 inches tall. #9-09 Framed lithographs from the Cue Masters series. 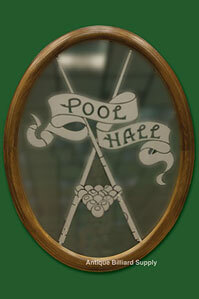 Each scene shows Victorian pool table, cue rack and framed billiard scenes on the walls. Left is Joseph Benet (1841-1919) and right is W.J. Peal (1854-1952). Nicely framed and ready for the wall of a billiard room. Each one is about 14 inches wide, 19 inches tall. #9-11 Vintage mirror for upscale billiard room. Hand-formed oval walnut frame with etched lettering and artwork in the glass surface. Rare accessory to compliment an antique pool table. About 27 inches wide, 36 inches tall. Excellent condition.